Oh my! 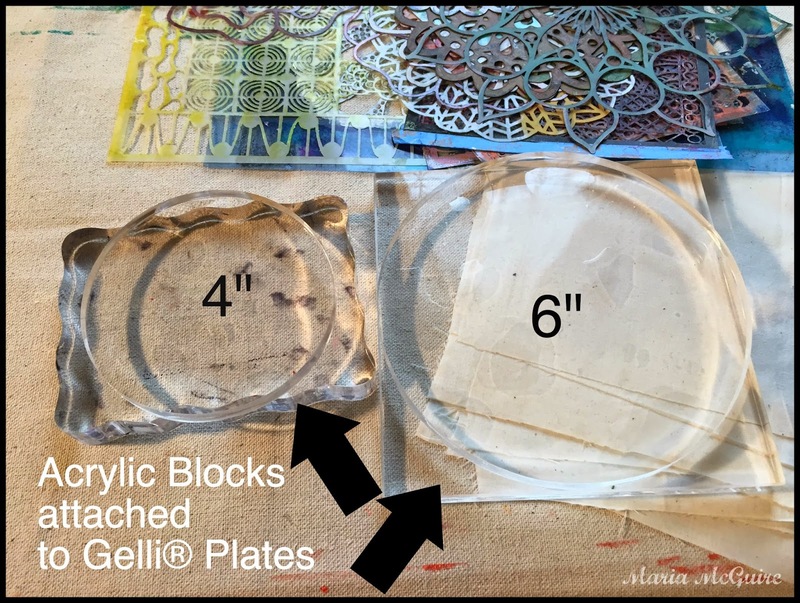 I think I have found the PERFECT size and kind of Gelli® Plate for ME! 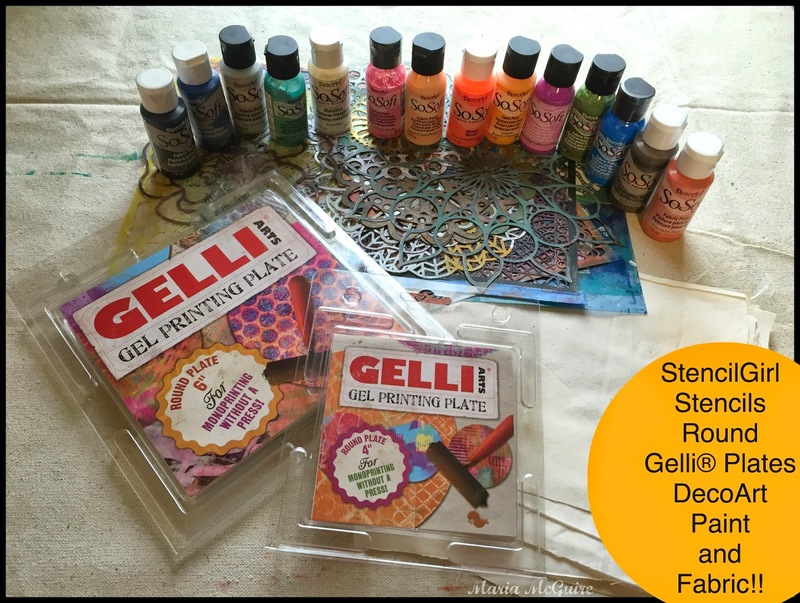 How fun to get to play with the 2 NEW sizes of Gelli® Plates from Gelli® Arts!! 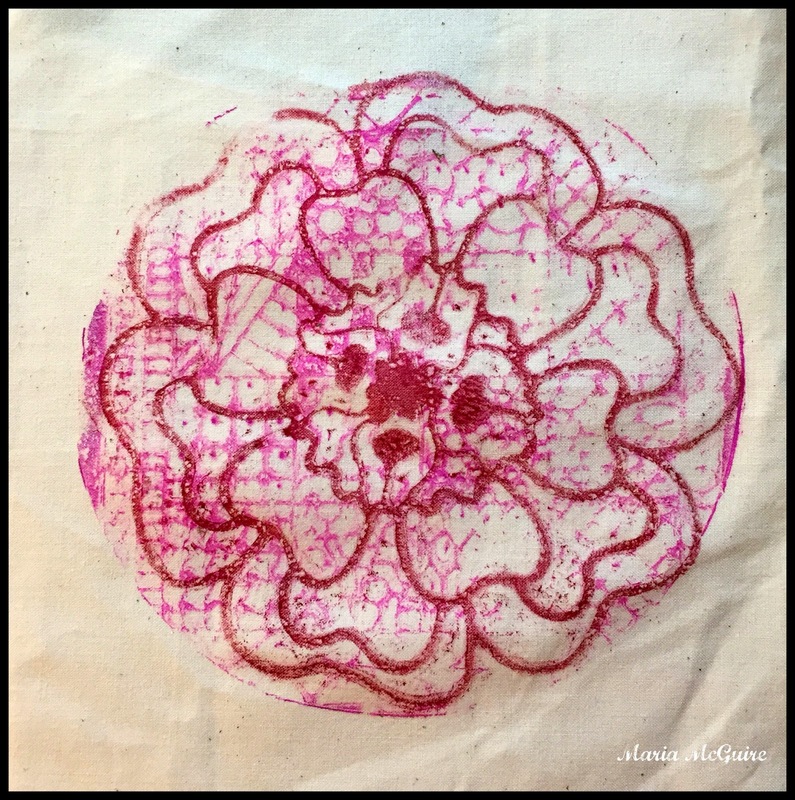 Add in some muslin fabric, StencilGirl stencils and some DecoArt SoSoft Fabric Acrylics and you have a winning combination! Being a long time stamper/scrapbooker I have many sizes of acrylic blocks. 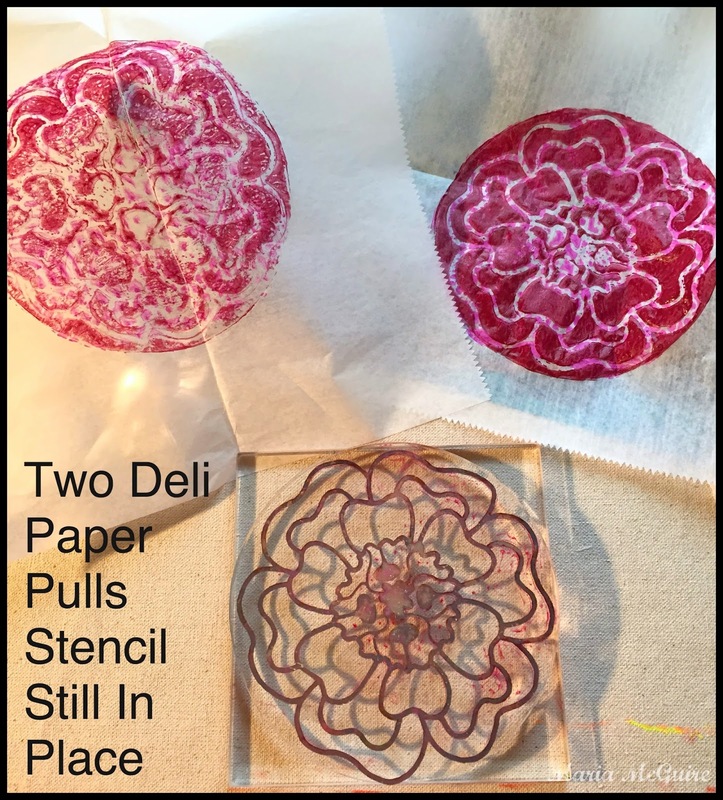 These 2 were PEFECT to mount my new Gelli® Plates. 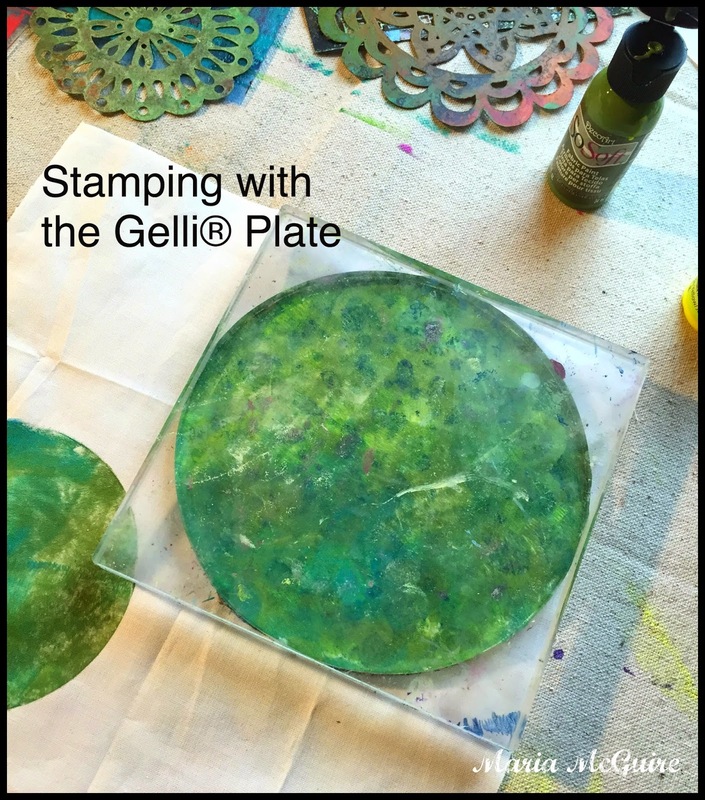 As most people know, playing with the Gelli® Plate is a little addictive and EVERY and I mean EVERY print is different and it is really all about playing with it. I'm going to show you the 2 ways I played with these to get the prints I did for this project. Remember, it is all trial and error and sometimes the prints you think are going to be awful end up amazing you! 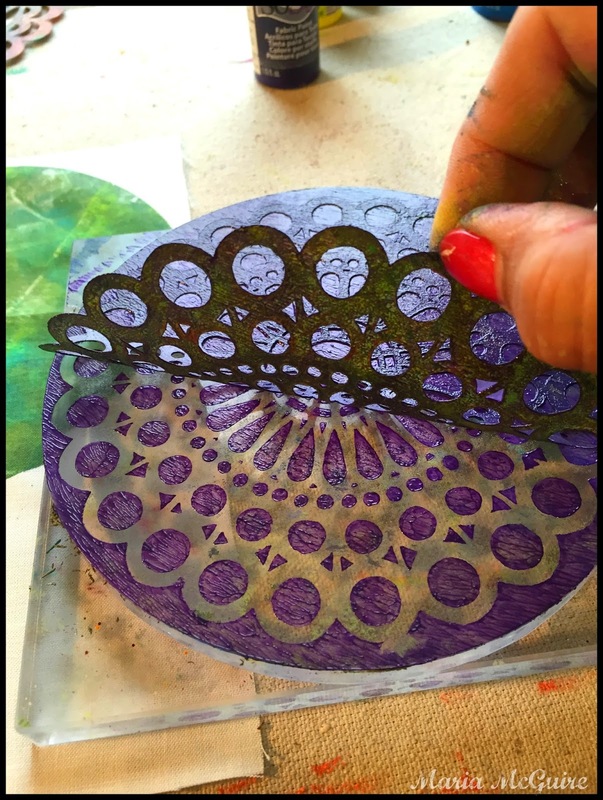 I also found out (by suprise) that quite a few of my own stencil designs from StencilGirl were a perfect fit to these Gelli® Plates. You can see all the stencils that I used for this project on my design page at StencilGirl. 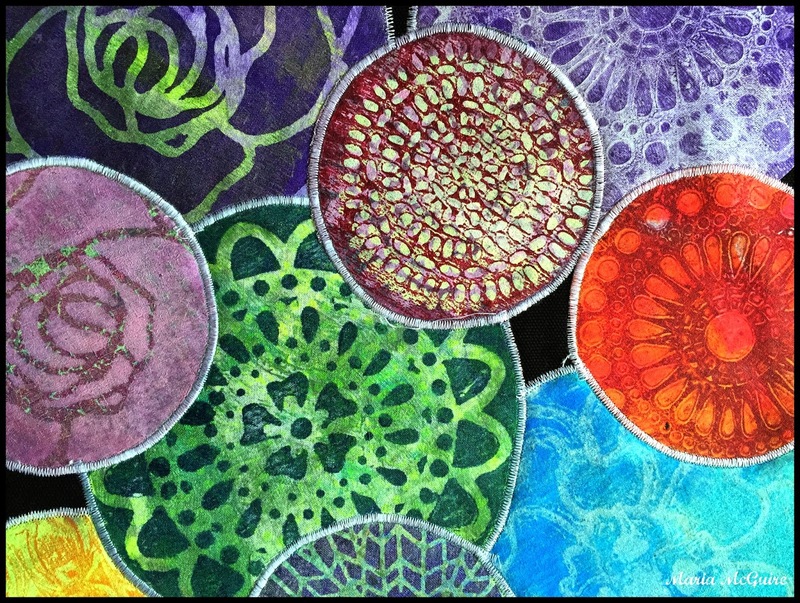 Using a brayer, put down a layer of paint on the Gelli® Plate. Place the stencil over it. 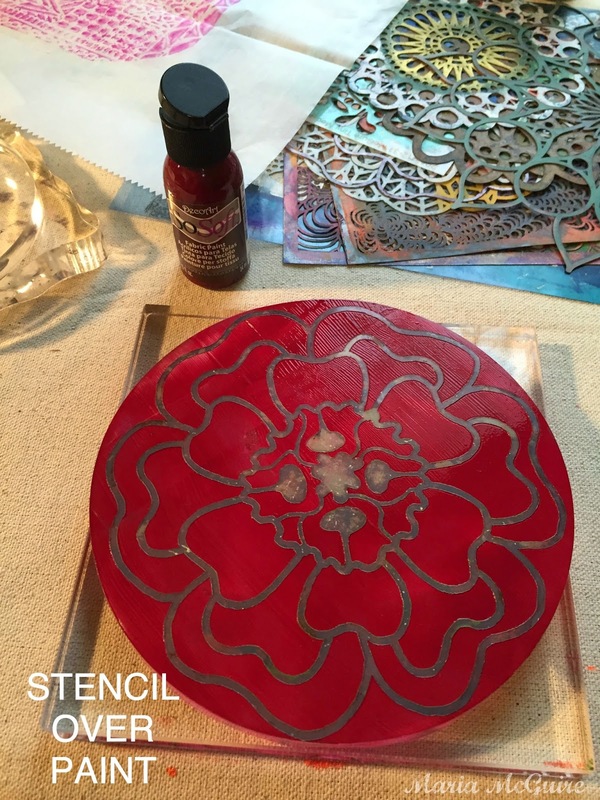 Use a piece of deli paper to "pick-up" the paint in the surrounding areas of the stencil. I ended up taking two pulls on deli paper. 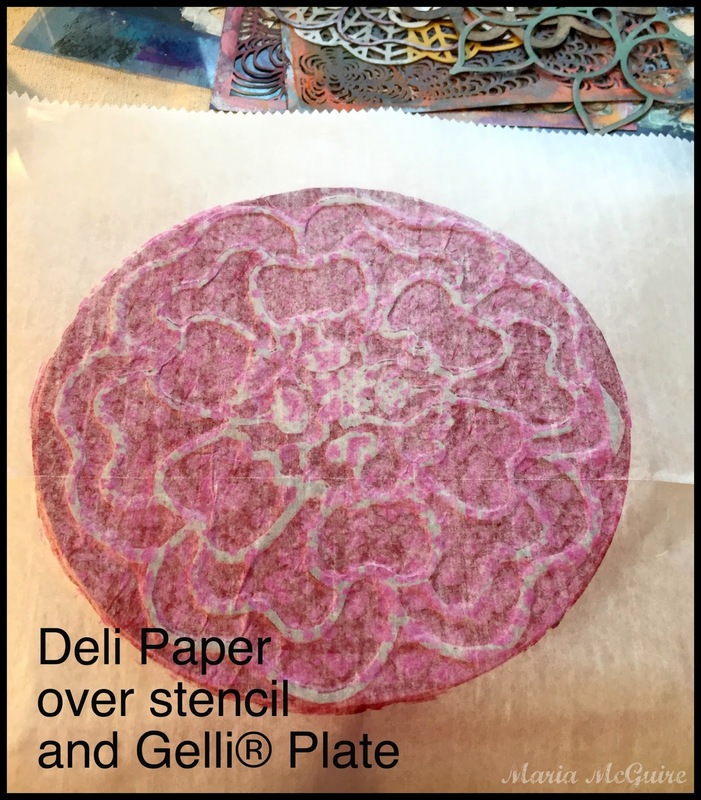 This is what was left on the Gelli® Plate and below a print that I made with that on fabric. Here is another time I did it taking a print with fabric instead of the above step with the deli paper. 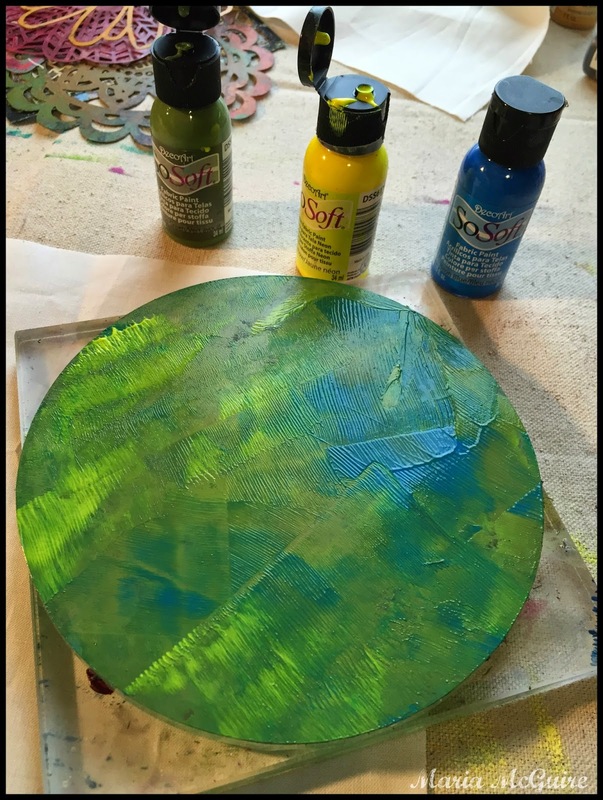 Add three colors of paint to the Gelli® Plate. 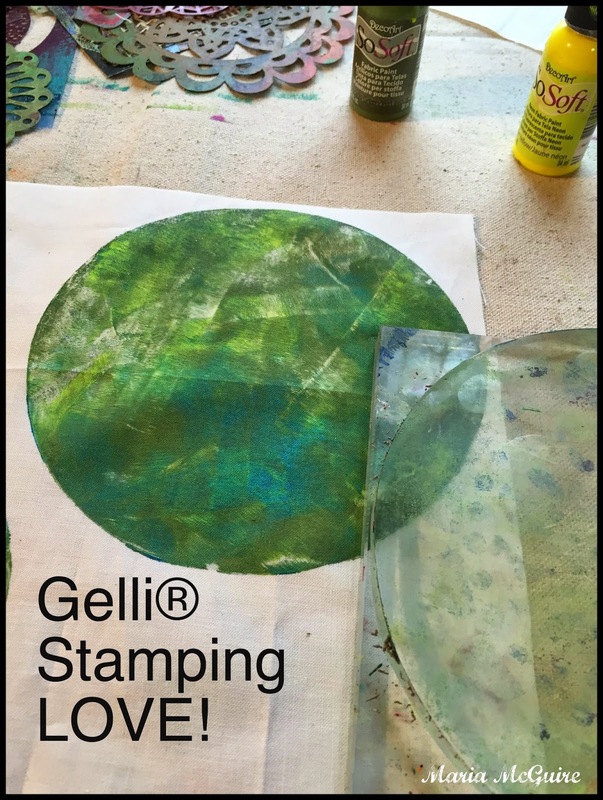 using the Gelli® Plate like a stamp pad, take a print onto fabric. 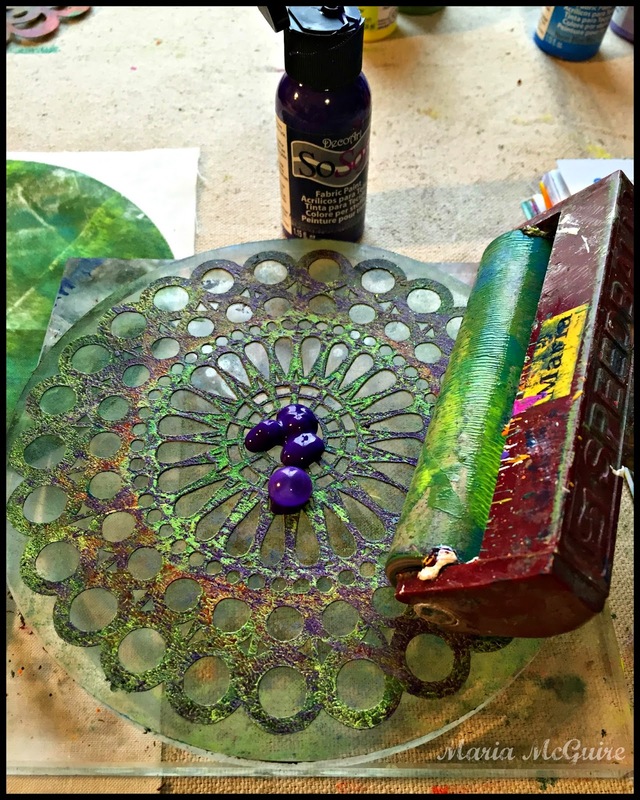 Now lay a stencil down on the clean Gelli® Plate and brayer paint over the stencil. 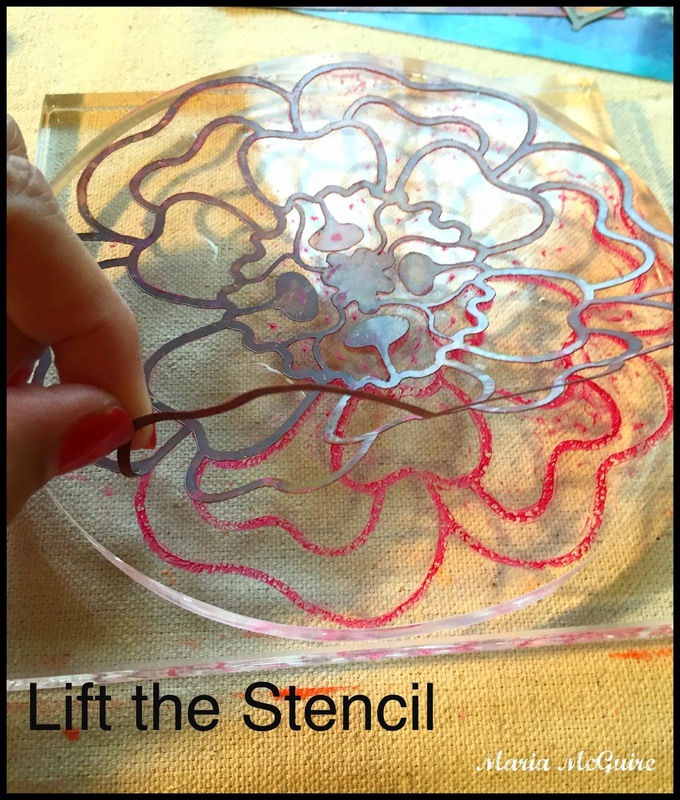 Lift up stencil = Awesome! Now use that as a stamp right over the last print! I spent about 3 hours making print after print onto fabric squares getting more excited with each and every pull! You can imagine I had quite a bit of deli paper pulls at the end too! Here is a photo of all those together. Of course, I had to cut them in circles! After I was all done, I wanted to put all the fabric pulls together in some sort of project. 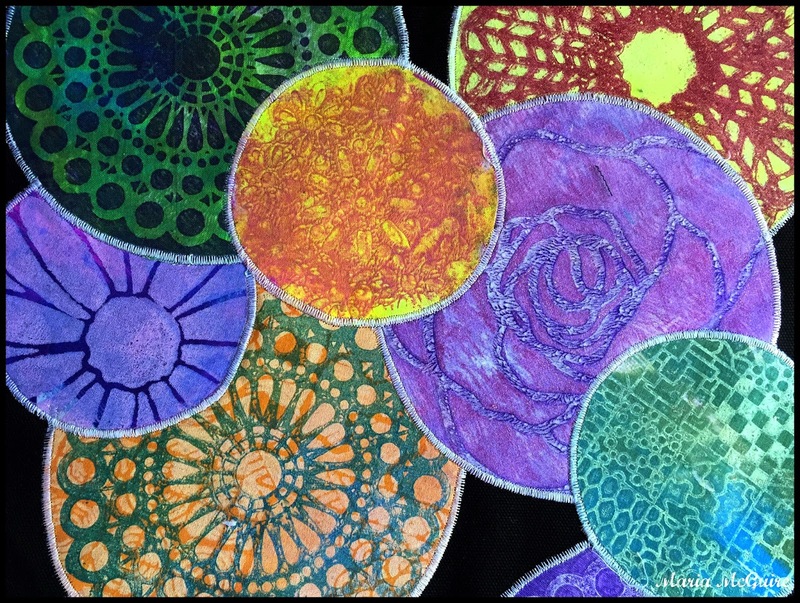 Since I was working with the round Gelli® Plates I had perfect prints of circles. 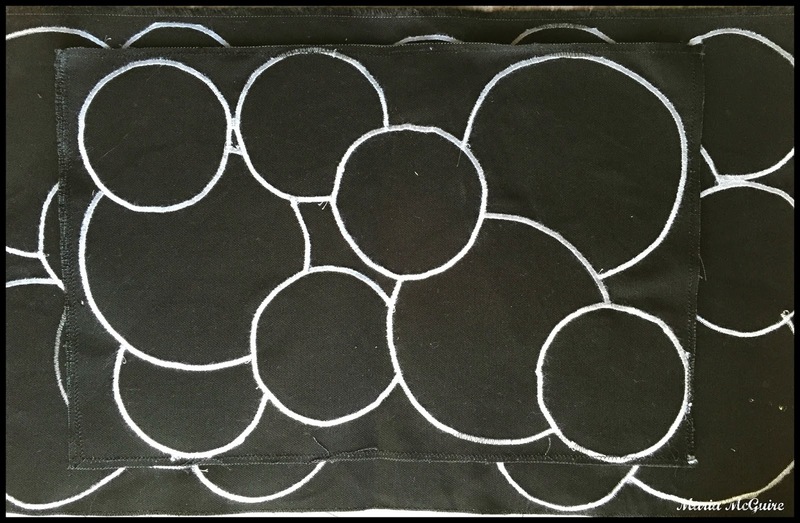 I cut around all them and mounted them with Heat and Bond onto black fabric and then sewed an appliqué type stitch around each circle. I had enough for 2 pieces of black fabric. These will become covers for my next handmade Art Journals. I'm thrilled at the way they turned out! The bonus! I had fun fabric on the back too! 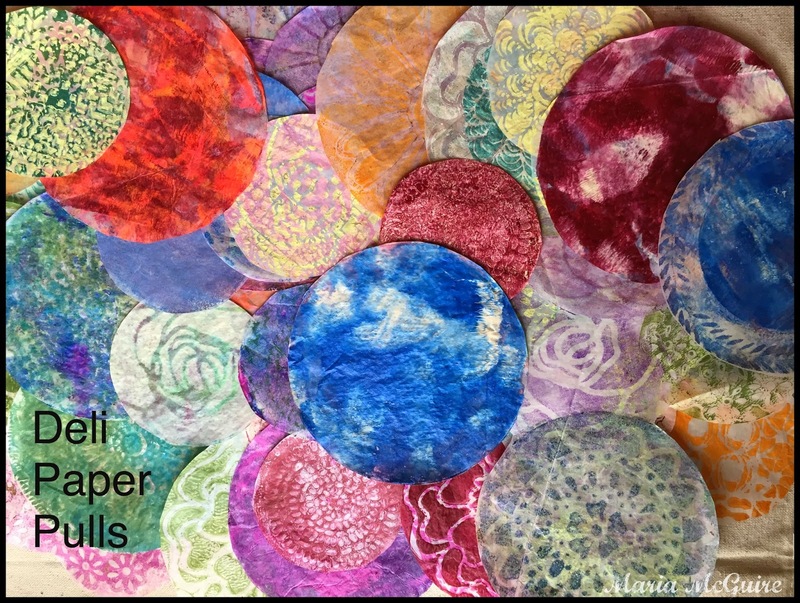 I have to say, I have all the sizes of Gelli® Plates now (except the 8" round) and these 2 are by FAR my favorite so far! They are also perfect for travel too! 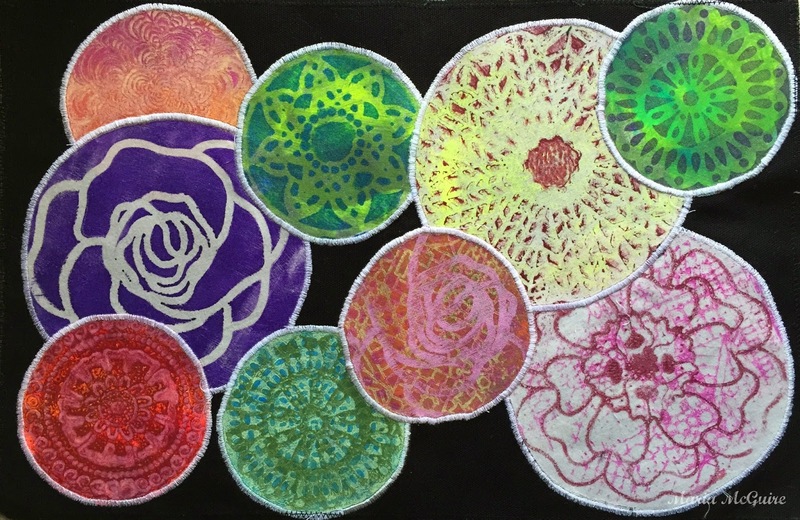 Love this post and the perfect fit of the small round Gelli® plates with your stencils! Thanks for playing with the plates and sharing all the fun that you had. 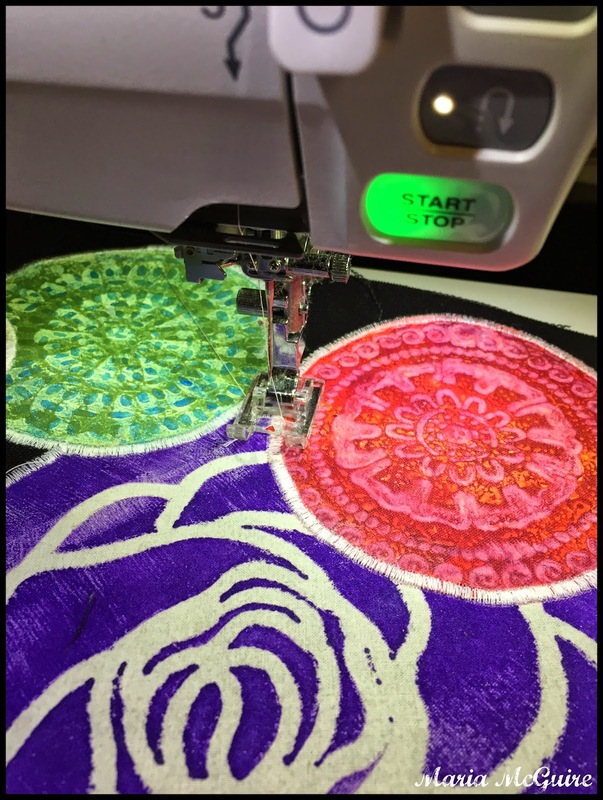 The twist on fabric printing is fabulous! OH MY GOSH! This is AMAZING, Maria!!!! Love the photos and your creation!! What an inspiration you are! 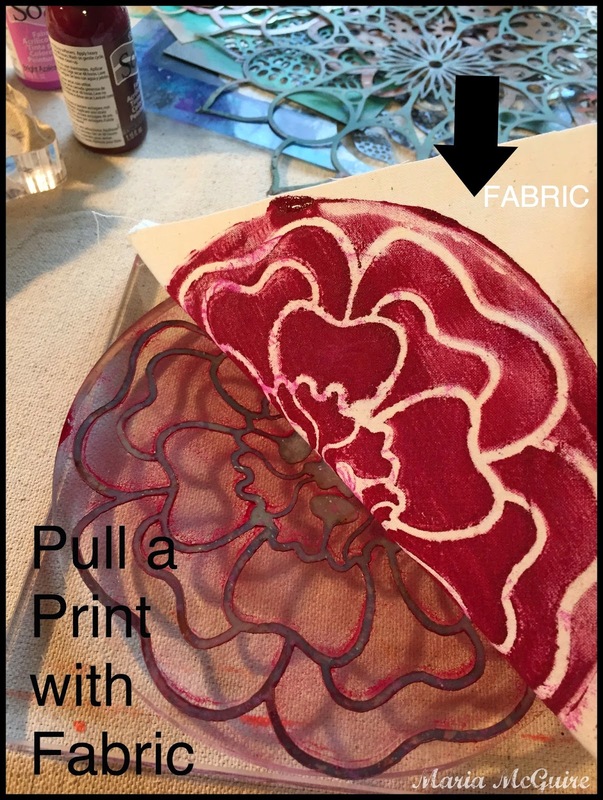 This is an awesome tutorial and I LOVE the fabric piece! Maria, WOW! Your work is stunning! I LOVE each and every wonderful circle! Your finished piece is breathtaking! Thanks for sharing your techniques in this tutorial. All of you photographs are really inspiring and showed exactly what your process was. Thanks, Maria!!! This project is awesome, Maria! 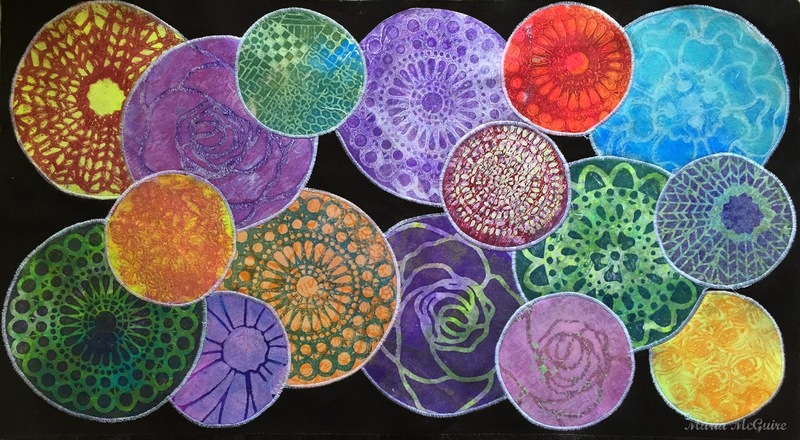 I love the look of the round printed fabric swatches on the black fabric background. Your work always amazes! great ideas! 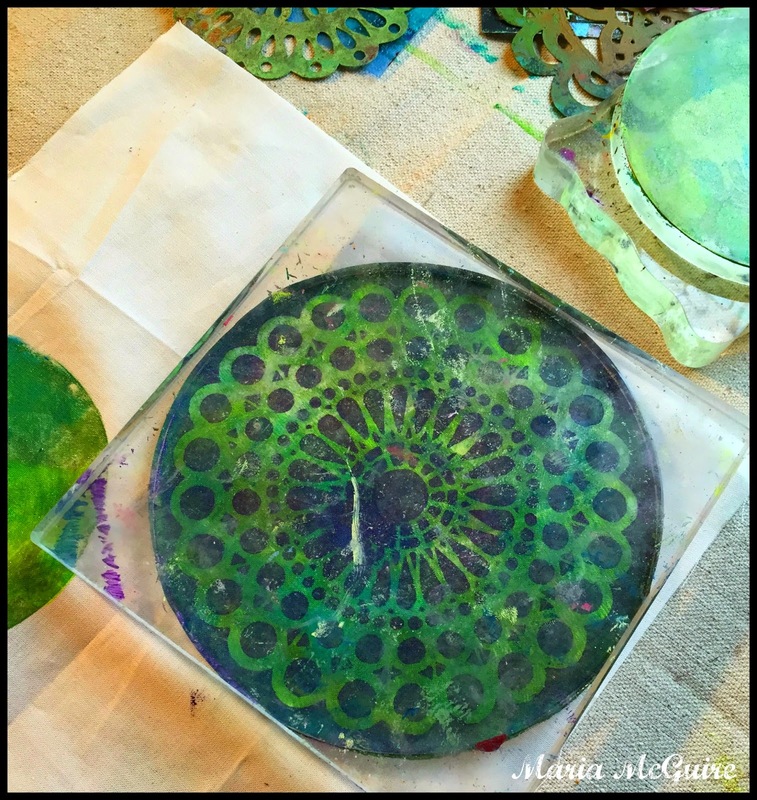 i need some help with gelli plate printing..i struggle with getting good results! Total fabulous!! Love these circles. Hi Maria - Great project! Great to meet you at Artiscape too.